Jason Derulo has unleashed the music video for his new single online. The singer-songwriter posted the visual clip for “If It Ain’t Love” to his YouTube channel on Monday (May 09, 2016). were collectively handled by The Monsters & the Strangerz (Fifth Harmony, Bebe Rexha) and Ian Kirkpatrick (Britney Spears, Nick Jonas). The track was also co-written by Lindy Robbins (Selena Gomez, Craig David) and Talay Riley (Dua Lipa, Keri Hilson). As mentioned in earlier posts, Derulo’s upcoming fifth studio collection – featuring previous single “Naked” – is expected to be released later this year through Beluga Heights and Warner Brothers Records. Other musicians backing Derulo on the new album are Jonathan Rotem (Gwen Stefani, John Legend), Poo Bear (Justin Bieber, Kelly Rowland), Infamous (Drake, Lil Wayne) and Smash David (Tinashe, Sean Combs). Watch the music video for “If It Ain’t Love” below. Jason Derulo has recorded new music with Poo Bear and Jason Derulo. Poo Bear – real name Jason Boyd – is responsible for co-writing Justin Bieber’s “What Do You Mean” [Def Jam], Jack Ü’s “Where Are U Now” [Mad Decent], Chris Brown’s “She Ain’t You” [RCA] and Kelly Rowland’s “Work” [Columbia]. Derulo, on the other hand, is expected to release his fifth studio collection – featuring singles “Naked” and “If It Ain’t Love” – later this year through Beluga Heights and Warner Brothers Records. Other musicians backing Derulo on the new album are The Monsters & the Strangerz (Meghan Trainor), Lindy Robbins (Demi Lovato), Ian Kirkpatrick (Britney Spears), Talay Riley (Nick Jonas) and Smash David (Tinashe). Listen to the audio clip for “If It Ain’t Love” below. Fifth Harmony have revealed the tracklisting for their upcoming second album. The pop quintet – composed of members Ally Brooke, Normani Kordei, Lauren Jauregui, Camila Cabello and Dinah Jane – will release “7/27” on May 27 via Simon Cowell’s Sony imprint Syco Music and Epic Records. Lead single “Work from Home” – now available for download via iTunes – was written by Jude Demorest along with Brian Lee, Alexander “Eskeerdo” Izquierdo and Joshua “Ammo” Coleman. Other album songwriters include Negin Djafari (Astrid S), Victoria Monet (Ariana Grande), Taylor Parks (Zendaya), Jared Cotter (Jay Sean), Alexander Kronlund (Ella Eyre), JHart (K. Michelle), and Clarence Coffee Jr. (Snoh Aalegra). On the production front, Fifth Harmony have teamed up with Stargate (Charlie Puth), Dallas K (Pixie Lott), Lukas Loules (Tinashe), Aaron Pearce (Celine Dion) and The Monsters & the Strangerz (Meghan Trainor). Peep the tracklisting for “7/27” below. Jason Derulo has debuted his new single online. The singer-songwriter posted the audio clip for “If It Ain’t Love” to his YouTube channel on Thursday (March 31, 2016). “If It Ain’t Love” – now available for download via iTunes in partnership with Beluga Heights and Warner Brothers Records – was co-written by Lindy Robbins (Demi Lovato, Selena Gomez) and Talay Riley (Ellie Goulding, Nick Jonas). Meanwhile, production duties were collectively handled by Ian Kirkpatrick (Britney Spears, Christina Aguilera) and The Monsters and the Strangerz (Meghan Trainor, Bebe Rexha). Meghan Trainor has teamed with Lunchmoney Lewis for her upcoming album. “Got home and cried like a baby tonight because of how excited I am for the future and this new album … Can’t wait … @lunchiebaby,” the singer/songwriter posted to her Instagram account on Thursday (November 12, 2015). Lewis previously co-wrote songs for Fifth Harmony (“Bo$$”), Jessie J (“Burnin’ Up”), Nicki Minaj (“Trini Dem Girls”), Flo Rida (“Once in a Lifetime”), Becky G (“Break a Sweat”) and Ciara (“Lullaby”). His first mini-collection “Bills” – featuring the title track along with “Mama,” “Love Me Back” and “Real Thing” – is now available for download via iTunes in partnership with Kemosabe Records and Columbia Records. Meanwhile, Trainor is scheduled to release her forthcoming studio collection and follow-up to 2015’s “Title” next year through Epic Records. The still-untitled project includes additional alliances with The Monsters & the Strangerz (Nick Jonas), Taylor Parks (Madison Beer), The Elev3n (Bea Miller), Babyface (Madonna) and The Rascals (Ariana Grande). Watch the music video for “Whip It” below. 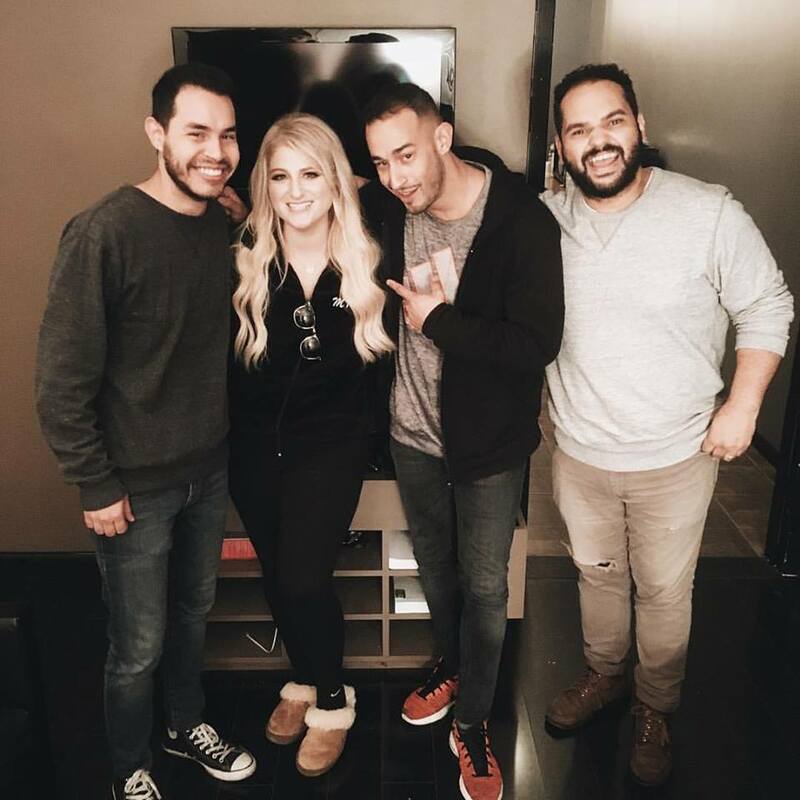 Meghan Trainor has reunited with the Elev3n for her upcoming album. “Recut an old song with the homies.. Missed you guys @the_elev3n,” the singer/songwriter posted to Instagram. Their other songwriting and production credits include Bea Miller’s “Paper Doll” [Hollywood], Karmin’s “Hate to Love You” [Epic], Ashley Roberts’ “Woman Up” [Metropolis Recordings] and Jesse McCartney’s “Superbad” [Eight0Eight]. Meanwhile, Trainor is scheduled to release her forthcoming studio collection next year through Sony Music Entertainment / Epic Records. The follow-up to 2015’s “Title” features additional alliances with Babyface (Madonna), Taylor Parks (Jason Derulo), Antonio Dixon (Beyonce), The Rascals (Ariana Grande) and The Monsters & the Strangerz (Nick Jonas). Watch the music video for “Better When I’m Dancing” below.